I probably should’ve considered my summer schedule before launching this feature back in April, but I also didn’t anticipate spending three months of Fridays sorting and packing the contents of my late grandmother’s home. Lay the blame where you see fit, but I have returned to pick up where I left off last June. Strange Suspense Stories #76 (August 1965) marked the second installment of Captain Atom’s mildly ballyhooed return as the core franchise in Charlton’s fledgling “action heroes” line. Like the previous issue, the stories are slightly retouched reprints from the good Captain’s Space Adventures run at the dawn of the Sixties. They’re also pretty dang lousy, even with the Steve Ditko art. 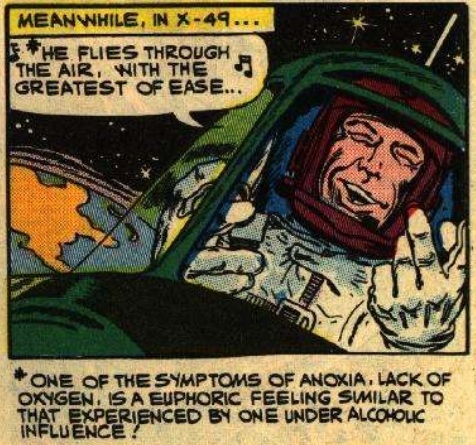 First up is “The Wreck Of X-44,” reprinted from Space Adventures #36 (October 1960). Atom (in his secret identity as USAF Captain Allen Adam) takes “the fastest rocket-plane in the world” for a shakedown cruise, not realizing that a red saboteur has planted a bomb behind the control panel. Things take a turn for the kablooey when the device detonates shortly after the plane escapes the atmosphere. The nuclear-powered hero emerges unscathed from the explosion and uses his vague superpowers to reconstruct the craft and guide it back to the test site. After a moment of puzzling about who planted the bomb, the saboteur decides to speed things up by fleeing the scene in his green Fiat 600. He is almost immediately apprehended by Captain Atom and everyone has a good chuckle about how the reconstructed rocket-plane is somehow tougher than the original. The end. …before taking an abrupt turn for the goofy. The Captain pays a visit to the Georgia residence of his NCO sidekick and best buddy Sgt. “Gunner” Goslin. 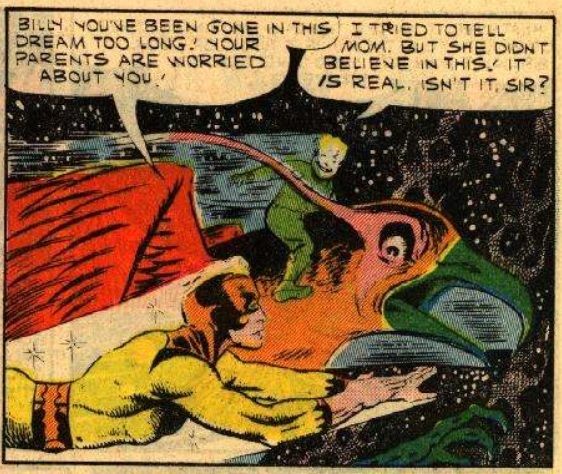 Upon arriving, Goslin’s wife explains that their young son Billy has been napping for two days straight and has been telling bizarre stories about a giant space bird who takes him on trips to outer space. Sure enough, he immediately gets attacked by a giant space bird upon arrival. 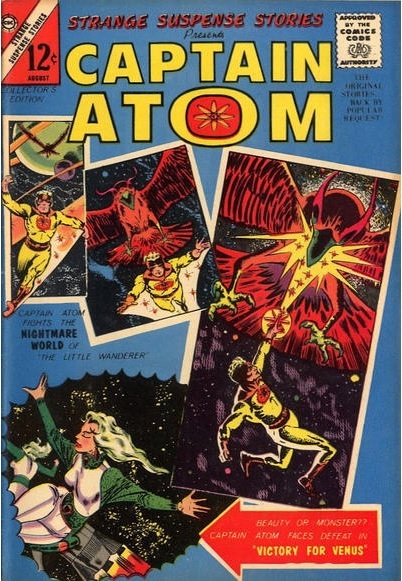 Atom uses his powers to dispatch the cosmic fowl, after which Billy shows up on the back of one of the bird’s cousins. 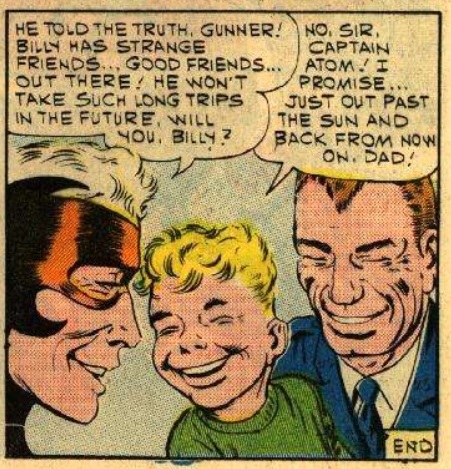 Billy agrees to wake up, Atom returns to earth, and they all have a chuckle about the precocious tyke’s capability to astrally project his being to the furthest corners of existence. The end. 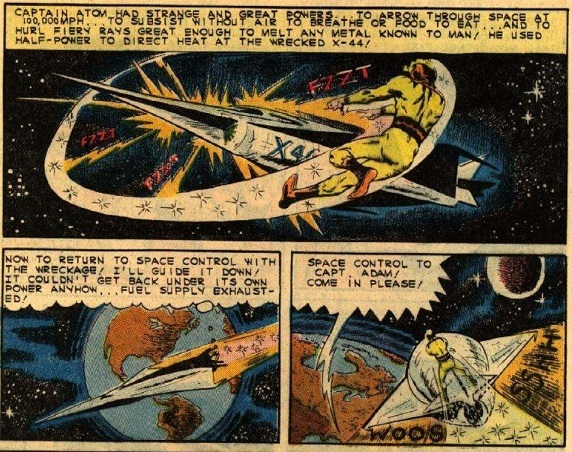 “Test-Pilot’s Nightmare” (from Space Adventures #39) features another rocket-plane, this one designed by a cost-cutting contractor who skimped on the pilot’s oxygen pump. 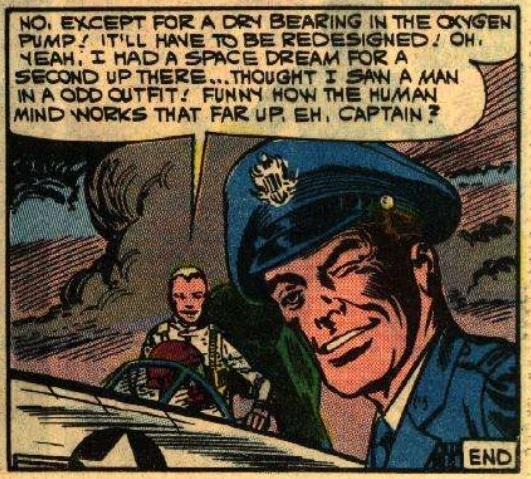 Atom tags along on the text flight, saves the pilot from a severe case of anoxia, and wraps things up with the creepiest sly wink ever put to ink and newsprint. The end. 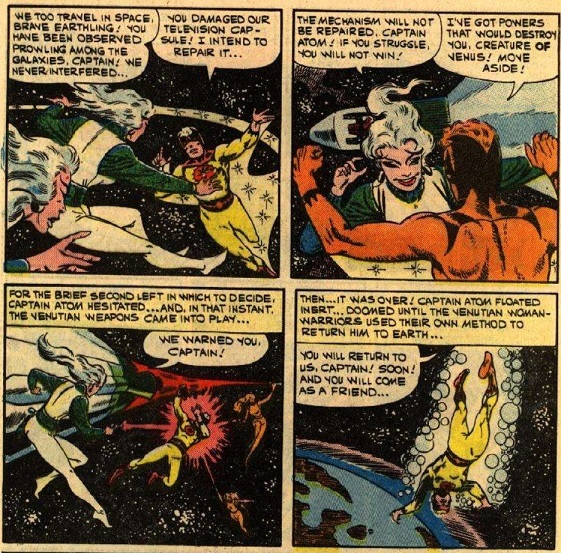 The Captain’s final adventure in this issue is “A Victory For Venus” (from Space Adventures #37). 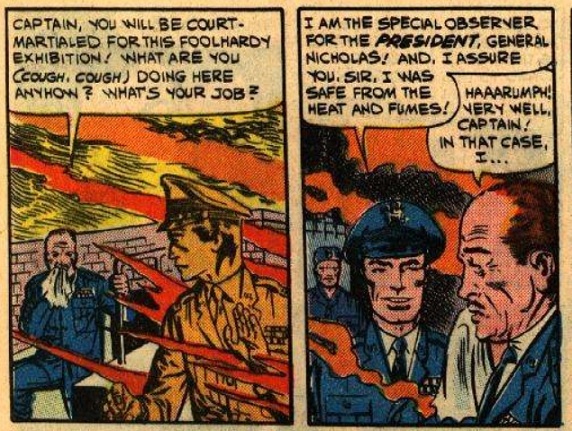 Atom gets tapped to be the president’s observer at the launch of an exploratory probe to Venus. It’s a big responsibility, and so our hero wastes no time trolling the rest of the crew with his superpowers and taunting the launch site’s staff with his VIP status. While watching the late-night video feed from the probe, Atom is startled by an alluring Venutian lady. The stock issue Ditko Femme breaks out some come hither moves before disabling the probe’s camera. The miffed yet strangely aroused hero jets off to investigate in person, where he discovers a trio of sassy Venusian dames kicking back on the probe’s hull. Atom insists on fixing the busted camera. 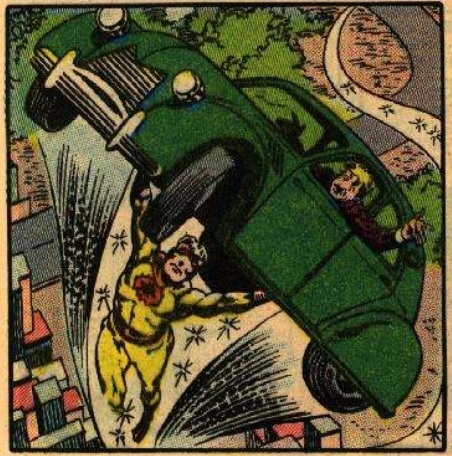 The Venusians insist on kicking Atom’s hinder and sending him crashing back to the launch site. 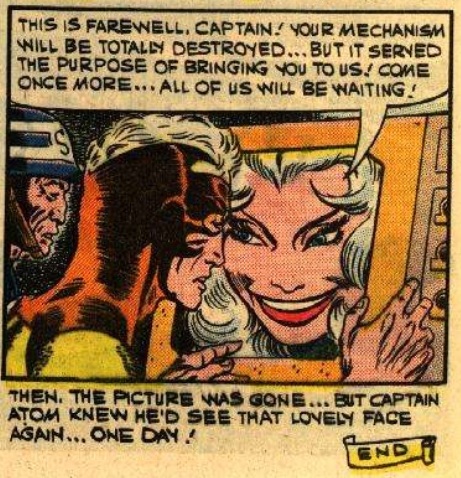 Not one of the Captain’s better days, but Venusians did at least offer the possibility for a second date during their parting direct-to-video taunts. The end…or was it? Oh man… These always looked so interesting from the Price Guide. Glad I never splurged at a con. Do the stories ever get better? 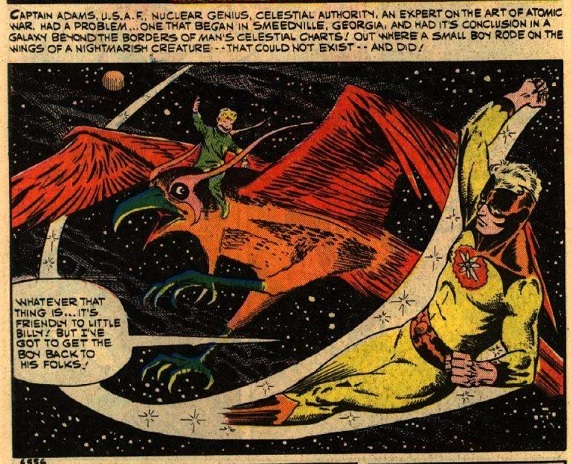 I feel both relieved and disappointed that Watchmen didn’t give us an edgy deconstruction of Billy and his space bird buddy.